Home / treatments using natural cures / FLUSH GALL STONES NATURALLY! I did this gallbladder cleanse today and was amazed at the amount of stones coming out! I had done one about 8 years ago when I had abdominal pain and the pain disappeared till recently, but no one seems to believe me! I am a nurse and I think it is great that we have access to this natural method and try to preserve the gallbladder instead of having surgery! The mayo clinic site says that it doesn’t work and trying to discourage people as they would like people to have surgery instead for all the income generated for hospitals and surgeons! I am going to do this, my doctor wants to remove my gall bladder and I am not willing to go through surgery. I will do the natural way. I don’t believe him when he states that’s all that can be done. I have had no pain what so ever at anytime but they state it is filled with sludge and stones. I will update you on this cleanse when I do it. Right now starting with the apple juice. Apple juice from the packed ist ok? The 1 litter juice can drink that kind of Apple juice? 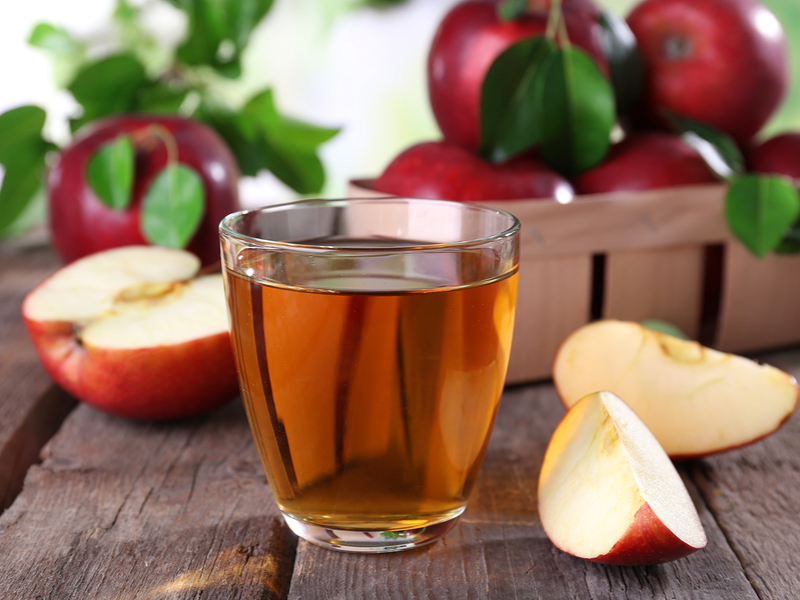 Yes, packed apple juice still contains the malic acid required for softening the stones, but these generally also have sugar, so best to use fresh apples when available. VERY EFFICIENT TREATMENT,MY WIFE JUST DID AND CAME OUT OVER 15 STONES OF ALL SIZES,THE BIGGER SIZE WAS ABOUT THE SIZE OF A BEAN SEED,WE THANK YOU BECAUSE MY WIFE WAS READY FOR SURGERY AND THANKS TO THIS MARVELOUS TREATMENT,AND YES WE DID TOOK PICTURES THAT WE WILL LOVE TO SEND YOU,AGAIN THANK YOU. I just did a flush, thank you….hundred of stones came out. I had one blocking bile exit, so exited that it worked! Thanks again! It sure worked! Got at least 100 stones out! Thank you so much! I took pictures but I’m unable to attach them. I did this flush last week and I’m still in shock. There were over 200 stones ranging in size from pinhead to large sultana. I have never written a post before, but I am so excited to have had such a result. My doctor is amazed too! I took some pictures as requested but don’t know how to attach them. I will do another flush, but perhaps will not add the vitamin c powder, but find something else to make the salts taste better, not bitter! I can’t wait to try this! My doctors are pushing me to have my gallbladder removed and I’ve been unsure about it and quite scared, especially since God put it there for a reason. I hope you tried the cleanse. It really works. I had no pain and saw so many stones I could count them all. I just completed my second cleanse today. In 2008 I had had 3 terrible gall bladder attacks and was scheduled for surgery. I hated the idea of surgery! So I did the olive oil/ lemon juice natural cleanse lying on your right side after (at the time I researched there was no mention of apple juice prior). I did the whole process twice and It worked like a charm. I cancelled surgery and have not had another attack since then! My daughter is going through gall bladder problems now and has started this cleanse process. Beats surgery by far. Recently i was scanned with multiple small stones biggest one 13mm, i was little skeptical at first to try this out but i did n m so happy it really works, i passed out like 10 gallstones which were green in colour, one of them was big one .. very soon m going to do the scanning again to check if any stones r still left.. thank u so mch for this solution otherwise i was about to do surgery..God bless u.. ill update again after the scan. I have done flush on 15-apr-2017 and pass more than 10 stones. But I went to ultra sound scanning, I have found many more are still in gall balader. I have planned one more flush on 30-04-2017. I have drink 1 qty of apple juice each day for 5 day during the morning hours with empty stomach. Every day eat with regular diet. At 6 pm, taken 1 Tbsp Epsom salt (10 mg) with a full glass of water. At 8 pm taken 1 Tbsp Epsom salt (10 mg) with a full glass of water. At 10 pm – mix and drink 150 ml of olive oil and 150 ml lemon juice. At 6 Am, taken 1 Tbsp Epsom salt (10 mg) with a full glass of water. At 8 Am taken 500 ML of grapes juice with 100 ML of olive oil. At. 11.45 Am, I have mixed one liter of water with 1 lemon, drink the lime juice. I have passed in this session more than 150+ tiny stones including big size (grapes size). I will be going scanning on Monday (1-may-2017) to find out anything is left-out in gall bladder. Now most of my stomach pain is come down drastically. Worked for me, heaps of stones came out. Mostly about 10mm in size and countless smaller ones. Will flush a second time in a month to follow up. This works. I did it in September and many stones came out. Drinking the oil made my stomach upset by I managed to sleep. It’s May and I’m on my second cleanse because I started to feel more discomfort. I’ll let you know soon if more gallstones passed. I would rather do this than surgery. I just completed my second cleanse today. The first I did in 12/16. I really recommended doing them like the Dr suggest. I will say the Epsom salt is horrible though but it is worth doing. I saw over 200 stones. Too many to count. I took a picture of some but I can’t attach. I’m gonna start drinking apple cider with organic apple vinegar again in 2 weeks to prepare for another cleanse. I didn’t have any pain and I recommend this first over surgery unless however your situation is more emergent. I’ve been experiencing wave like symptoms for 10 years. I had an ultrasound thinking it would surely determine I had stones but they couldn’t find anything wrong. I started getting severe pain to my rt abd and between my shoulder blades. Being a nurse I knew it’s time to look for some help. I believe in natural methods first and believe me it does work! I prepared for this cleanse and did it Yesterday and today 5/7/2017 I can honestly say that this flush produced for than 50+ stones! I am going to continue to do this flush monthly until I produce no more stones! I was scheduled for surgery like many of us were but I can definitely cancel my surgery till further notice! Praise God for his intervention in our lives and him allowing me to find this website! I have pictures I would love to share the biggest stone I produced was slightly over 1cm I was told that my biggest stone seen on ultrasound was 2.3 cm. This made me feel better! A good start to healthy eating. Been in alot of pain for about 6 months now, doctors decided they needed to take my gallbladder out next month so I thought I’d try this flush as I had nothing to lose. It Made me feel quite Ill but the end result was amazing, over 100 stones came out and I was shocked at the size of some of them. I am amazed, shocked and very relieved. Thank you so much for this. Good Morning I have nearly completed my Gall Bladder cleans. It was a bit of a shock seeing those bigger green stones in the sive. I’ve taken some photos. I’ll do this again in a months time. I chose to give this Cleans a go as I was told I needed surgery asap. I don’t like the idea of Surgery as the first option. I prefer to give alternatives a go first. Thank God for leading me to your website while in hospital awaiting for the process of my surgery to remove my gallbladder as doctor has strongly recommend that there’s no other options to remove the gallstones only to remove my gallbladder I told him to give me a chance to think about it so he discharged me with a letter for my GP that he highly recommended for me to come back to do this surgery and I have to go back in one week to my GP for review and for my GP to send a referral to them for me to come back to do this surgery. I have found your website and came home and follow your recipes and thank God for using you as a healer to us the gallstones is coming naturally I haven’t found a big size but couldn’t count the stones most are in mustard size some is little bit bigger. Thank you for your help and God bless from Australia. I thank you so much for all you’ve share for this article..It is really trully a big help for all the people like me , who doesn’t have enough money for the operation..The Dr.told me i have only a big size of gallbladder stone 1.88 size..But today a lot came out ! And it feel so good to my abdomen ..Guys out there thank you for sharing this method..It is trully a relief ..Trully you cared a lot to all people.I don’t believe to all advertisement but my friend Gideon told me this..May God Jah bless you all. This is incredible! I had no doubt it would work as I’m a big advocate of natural remedies but it surpasses my expectation. I’ve been having pain on and off for a year now, which increased considerably in the last few months. I couldn’t eat any fatty foods or drink alchohol without being in pain the next day.. rightside abdomen and radiating up my chest. I did the cleanse last night and it wasn’t as bad as I thought it would be. Woke up this morning and hundreds of stones, all sizes (gravel, tiny and almond size) are pouring out. I will repeat this again soon and keep doing it until there are none left! This is amazing. I am going for a surgery in next month. But before that, i think I should try this. I had all the clinical signs of gallstones but not in acute distress. Only intermittent pain that would last 15-30 seconds at a time. Did NOT want to have unnecessary surgery if there was an alternative. While unpleasant, seemed to me that this technique would beat the hell out of surgery if it worked. Prepped for two weeks with apple juice and started the cleanse last night. Hundreds of stones expelled this morning, most so far raisin-sized green and soft/puffy like, matching perfectly pics of gall stones that are imaged online. Can imagine I’ll need to repeat this a few times to fully address the gallstones, but very relieved that this technique obviously works and impressed at the results. Incredibly grateful to have found this technique. Thank you for posting it. The only addition you might consider is a reminder to drink lots of water. For me, diarrhea started within 30 minutes of first Epson salt drink at 6pm this morning and continued several times throughout the night, but stones didn’t appear until this morning. I could imagine dehydration might result if you’re not consuming enough water in addition to following the otherwise excellent directions. Thank you again! It works! I didn’t see any results until 45 min after the last dose of Epsom salt mix the fallowing morning felt normal all the way the the process. This should probably be explained better due to thinking I wasn’t doing something right ? The fruit and cooked cereal help flush before getting to the first dose of Epsom salt mix. Thank you for a good feeling! I was recently diagnosed with gallstones and my doctor immediately recommended surgery- I didn’t want to do it so I decided to search for an alternative. After reading the positive feedback from people who tried this flush I decided to do it. Even though my husband was not diagnosed with it he decided to support me by doing it with me. We did the 14 days apple juice and yesterday we did the Epsom salts / olive oil flush. After the first salts within 90 minutes the diarrhea started and continued throughout the night for me, my husband slept after the olive oil 10pm until 6am. Around 3am I started seeing the green balls- it was a lot and I stopped trying to count. It happened to my husband also, so even though the symptoms or pain is not there the stones are in our systems. I am going to do an ultrasound sound by Saturday as I am very very curious to see if the stones are no longer there. I will post the results. Thank you for posting this alternative to surgery. Thank you Doctor G. For offering this healing technique for the gall bladder! I was a little nervous about trying it but am astounded at the results! I am 57 years young, female & living in Virginia, U.S. I have been very healthy my whole life, do not take any medications, and eat pretty well. Had a painful attack a couple years ago, had a sonogram last year that showed nothing, said I had good liver & gall bladder. Last month, I had another flare up so I tried the procedure last night after drinking apple juice for 2 weeks. This morning 45 gall stones came out! No pain just lots of liquid coming out with the stones. Thank u for saving me from surgery, saving me money and supporting me with a continued belief that we truly can heal ourselves through natural remedies and practice. By doing your gift doctor, you’ve given me an even greater gift! Thank you! Hi, from 2012 till yesterday i was in pain every time I eat a high fat food like pizza. I decided to do a search over the internet to help with my gallbladder pain from last 5 years. GOD BLESS U. I did this therapy and its 6 pm in the evening next day within 24 hours of the therapy. My gallstones are out thousands, sizes varies from a kidney bean to a grain sized. Amazing. My stomach feels lighter. God bless U.
Bless you for this amazing post! I had been having tons of abdominal pains starting in May 2017. It would come and go like 2x per month and i had no clue what it was? I went to my primary care doctor and she had assumed it was IBS due to the symptoms I was having. So she told me to change my diet to a low-fat, non dairy one. Well, that didn’t work because on Wednesday, August 23, 2017 at approximately 11pm I had to go to the emergency room because the pain was too harsh to bear. They did a sonogram of my abdomin and said I had gallstones and needed to see a surgeon. I refused surgery because my wife said she believed there had to be a natural way to pass stones. The next day we got online and found this post. 7 days later, I have passed over 300 gallstones and lost over 7.5 pounds. I feel great and it’s all because of this amazing apple juice and epsom salt treatment. NO SURGERY for me! Medical professionals should be ashamed of themselves for removing people’s gall bladders knowing it’s not necessary. Thank you for sharing this .after reading this post I told my mom the procedure . after two years of intense pain .this was her solution . she was booked for surgery in November this year . But thank God she does not need it anymore . after the first cleanse she said pain subsided .then! After second cleanse big big big stones came out . Thank u .
I did this cleanse yesterday into today and am amazed that over a hundred stones passed. I will repeat it monthly until they are all gone. Thank you Dr. G. for posting this cleanse. Thank you… 10×2.1cm was the largest..flushed just this morning.. Supposed to go for operation today 07 October 2017.decided to start my cleanse sunday 1 October 2017. Now ready for ultra sound but operation no no big NO. Thank you thank you thank you so much.. GOD bless you a million fold..
Hmm is there an alternative to Epsom salt? Or can we go without that? The EPSOM SALTS, or magnesium sulphate, is important to help open and dilate the gallbladder and hepatic ducts, so should not be skipped during the flush. We have yet to find a substitute to this nasty-tasting salt, even though holding ones nose before drinking and while holding nose drink a little fruit juice to wash away the after-taste – this seems to work well for most people. Just did this flush for the first time and it worked. I was told that my gallbladder is full of stones so I was expecting more stones to come out (I would say that I flushed at least 30 small stones and 1 large stone, the size of a quarter, and 3 medium size stones). They were all green in color and quite soft due to the pectin in the apple juice. Once the frequent bathroom trips, due to drinking the Epson salt mixture, slowed down I felt back to normal. I ate watermelon as soon as I could begin eating/rehydrating and had no nausea. Holding your nose while drinking the Epson Salt mixture (and the olive oil mixture) definitely helps to prevents nausea and makes it much easier to stomach. Thank you and God Bless you for sharing this (I plan to do it once a month, or until I don’t see anymore stones). Thank you so much that i’ve found this article.i made my cleansing last sept.30, 2017 and i was shocked that countless stone with color yellowgreen.The first batch of stones was monggo like size, the second batch was corn like size and the 3rd and last batch was peanutseed like in size.I plan to have an ultrasound later to check if there’s something left in my gallbladder. Thank you for this extremely helpful posting. Allow me to ask a few questions. Please allow me to give you some background information. I’d very much appreciate your expert advise and feedback. Thank you kindly. Background: Just last week I felt some discomfort under my right rib. I went to see my primary physician and he checked me and said that he feels that I might have gallstones in the gallblader. He asked that we will need to get a stomach ultrasound done. Background: Just last week I felt some discomfort under my right rib. I went to see my primary physician and he checked me and said that he feels that I might have gallstones. He asked that we will need to get a stomach ultrasound done. My ultrasound is scheduled for Oct 16th. I have very little to no pain but do feel slight discomfort in the area as described above. Question: Do I have to wait 14 days BEFORE I begin the cleanse? Can I not commense the program at any time, say this weekend? Please advise. Yes, it is important that you drink about 1 litre of apple juice for 14 days BEFORE you flush to make certain that the stones are softened with the malic acid that apple juice contains. Thank you for sharing this good intruction.. this is so effective.. last last week i ultrasound for my medical for my application..and saw a 1.4cm gallstone and gallstone multiple.. and thank you because i plan to go a surgery.. thanks god. And thanks dr. G.. You used our lord to spread this… Thank You very much..
I’m doing the cleanse just now. This is the third time I have done it in a few year. It always works well for me. Last night after my last drink of olive oil & lemon I lay down then had to run to the toilet after around 15-20 mins. No stones yet but got one more Epsom salt drink to take. Hope it still works. Wow!!! it worked for me as well..got a lot of stones out (including a big one).. thanks a ton for the detailed instructions… its amazing…plan to do it every month till i am rid of all the stones. So very happy that I found this site and I thank you most sincerely. My niece had gall bladder pain at the same time as me and immediately went in for surgery. My daughter-in-law is a GP and she told me I would have to have surgery. I found this site and have to admit I was skeptical – but I also have to admit I was wrong. A couple of months ago I did my first cleanse – it was painless and I got rid of hundreds of stones – some very large, some small and some gravel. It reduced my pain but within a couple of weeks I had some more pain – albeit less painful than before. I figured that was because more stones had moved forward. I just finished the second cleanse and got rid of maybe another 100 stones and again some gravel. There were certainly less this time which makes me think I am getting there. When I originally had a gall bladder attack the pain was excruciating and lasted up to 7 hours. More recently it has been much less painful and for maybe half an hour. This information has been a God send to me so thank you again. I am now starving so going to have some juice – and then some fruit and……..
For anyone who reads the article and is skeptical, please give it a go – the gall bladder has an important function and you need it! Thank you so much for this natural cleansing health procedure! !woah!I just made my 14thday of cleansing yesterday and this morning was like. .THANK YOU LORD!. .I just filtered above 10 green gall stones!amazingly this is so lit! Back when I had my checkd up a weeks before I started searching for any natural remedy the doctor said I have a 1 tiny stone in my gall bladder but to swear on this day Ive flushed almost half inc measures of number of gallstones!worry less!Thank you very much for this page and to the people who published this helpful tips on cleansing!More power!. . I have had pain in my lower back for around 2 years, finally I had a scan which showed gall stones. After reading the comments on this web site I carried out the flush. The Epsom Salts and Olive Oil were not as bad as I thought to take. The results were amazing, I passed dozens of stones and the pain was eliminated. I wish I had known about the flush earlier, thanks. If in doubt FLUSH it OUT. Thank you Lord for this information. I flush hundreds of gallstone today morning the bigger one is half size of grapes. And followed by same size of macademia nuts. I have just tfied this and it did work. I was feeling pain and a burning sensation on my left side of my lower abdomen had an ultra done and they told me that it was my gallbladder. They referred me to a specialist but instead of going I tried this. 30 stones came out and counting. Thank you so much for sharing this post. I hope I feel better prior to doing this I did a diet along with drinking the apple juice and I don’t feel anymore pain. and im back with much much thanks, i suffered with gallstones during 2 pregnancies over 3 years and was being pressured by Dr’s to have my gallbladder removed… i have passed more than 60 stones with lots of debr and i kno more is to come as ive just taken my last dose of epsomsalts. i defo recomend this, no surgery. God bless you for putting this out there. as a mother i was crippled when ever i had an attack. thanks again i will do this once a month until i am clear then every so oftine. Thank you for this has helped me. having just done it once with 100s of small pieces flushed out. Reduced my pain to about a 3rd looking forward to a another treatment and hopefully no more pain. This was a process everyone should be offered before the option of the removal of their gallbladder. I have more energy and for the first time in years able to walk freely and enjoy my day. Thank you from this New Zealander. Thank you Dr. George for the thorough instructions on the Gall Stone flush, and I was able to release about 20+ stones. I was told that I have to remove my Gall Bladder three weeks ago, but I knew I had an alternative so looked up Gall Stone Flush from Dr. George and followed it. I will continue to flush out my Gall Bladder until it is super clean! Flush 1 – I did the flush and had amazing results. Hundreds if not into the thousands of small stones ranging from yellow green to brown (mostly green). One critique if I may, there was no dialogue about the sphincter agony that comes with so much diarrhoea during the process. I believe that should be discussed with recommendations to ease this (if offering this treatment). There must be an ointment or something out there that could stop this from occurring or lesson the pain. While I will do this again, the pain I have mentioned is certainly now my biggest worry. Apart from that, very pleased and thank you. No words can express the gratitude. I tried the flush today and got 100s of stones out in the first attempt itself. The biggest one was about 16 mm, though the ultrasound last month showed that biggest one is 9.3 mm. I will soon have another ultrasound done to get this verified clinically as well. I have done the cleansing twice now……. Dont know how to express my gratitude, sir …..I am overwhelmed… During the first cleanse, numerous number of green stones along with debris came out.. I did the first cleanse in November 2017…I use the packaged apple juice.. I strictly followed your directions.. Had an ultrasound in January 2018 later.. No stones were there.. But it was mentioned “multiple coarse echogenic foci”… Might have moved out from liver as you said.. So I did the second cleanse last day.. Now all sort of debris gone.. I express my sincere gratitude from the bottom of my heart. Especially I am scared of surgery.. Last June, Dr had advised me for keyhole surgery to remove the gallstones. Actually, this is a miracle. I gave wide publicity to this procedure to all my friends and relatives. All are wondered. Sorry sir, I couldnt take the photograph of the stones…. My liver size was 16 cm before the first cleanse, after the first cleanse, it’s 12 cm now. Thanks again sir, May God bless and helps you to come out with more natural techniques in future, for the world will be indebted to you ever. Advised and supervised (!) my wife who had 2 stones, one of size 1.9 cm / 19 mm and other slightly smaller. This morning she flushed out in 2 episodes. Very pleased. A big thank you for the brilliant write up and putting on net. I have taken a few pictures and going to send / post as well if I could. I am really very thankful that I stumbled upon this website. I was reluctant but I’m glad I had the courage to do this. I have been going back and forth to my doctor for pain that has been bothering me constantly. Although she said there was nothing I could do but wait until a surgery is necessary. I was really shocked when I first saw all those green gallstones. Almost 60 stones on my first with 3 big ones. The next were more grainy, dissolving stones, big and small stones. There were also lots of small black seedlike stones. I must have passed about 200 or more stones. I am happy and I am ever grateful to you, Dr. George J Georgiou for sharing this amazing treatment. More power to you and your staff. I would like to say thank you for sharing this natural way to flush gallstone. I tried it and it really works! I flushed hundred of stones this morning aftr all the procedure the sizes some most of it like a grape size. I am feeling relieved now. And the pain has gone. Thank you very much! May Godbless you more! You helped alot of people because of this article you made. I have just done this cleanse and it really works. I was a bit worried to begin with as I had no bowel movement last night but from this morning I have seen hundreds of small stones and several bigger stones (size of coffee beans) pass. It is really amazing. I have had gallbladder symptoms for several years and two weeks ago did an ultra sound and was scheduled for an operation last week. I am so grateful that I did not do the operation and did this cleanse. Thank you!!! I must admit, at first I was skeptical about this whole thing but after doing the cleanse and seeing all the gallstones, it is safe t say that it works! Thanks again for everything and for whoever is experiencing problems, please try this because it will help you. Visual proof is very powerful. This is my third flush, and I was stunned by what came out this time. I’ve been suffering from acid reflux and poor digestion. After my prior flushes it was MUCH better, but then it was starting to return. So I reflushed. Holy cow. Look at these pictures folks. This is real. I read this article months ago. You have to repeat this process until two successive flushes show no stones. I’m obviously not there yet! As a follow-up. I ended up doing six liver flushes before discovering I had Liver Flukes! I couldn’t understand what the tomato skin looking things were in my flush results. Then after googling other forums, I discovered what they were. I did Dr. Clark’s parasite cleanse, and have since followed up with three additional liver flushes. My digestion is now COMPLETELY NORMAL. I got rid of the critters, cleaned out the liver and gallbladder, and no surgery or medications required. This is honestly after having battled this issue for a half dozen years at least. I followed the steps as indicated and it is a miracle! Several doctors said I had to have surgery and it was the only way to get rid of the pain. I am so thankful to you and your staff for putting this on the internet. Good things will come to you for healing us! Thank you! I did my first session last night and plan to do another next month because I too ended up in the emergency room. I LOVE YOU! I’d been taking a few various herbal combinations for months before discovering this website (upon recommendations by my health care practitioner) to soften, pulverize & hopefully pass any gallstones, as well as kidney stones. I feel this had helped somewhat. I had not suffered any acute pain, but rather more a frustrating discomfort in the area under my right rig-cage & around into the right upper back area. 2 medical doctors had told me that I was having gallstone discomfort, but no tests were ordered to prove that. I truly could “feel” the stones moving about. I was adamant that I would avoid gall bladder surgery, unless my life became endangered. I was researching gall bladder flushes online & became a bit overwhelmed with techniques here & there that were suggested, but never felt confident with their suggestions. Then, I discovered your website. Your instructions were so thorough & all the comments of participants were so current, heartfelt & detailed, I couldn’t help but feel drawn to try your procedure myself. I had my husband present & nearby me throughout this procedure, because I was anxious & a bit nervous about trying something new & so important. I, too, followed your instructions exactly & even studied them over & over with my husband before beginning the procedure. The only thing that still remains a bit unclear to me is EXACTLY how much apple juice per day you recommend. It appears that you say 1 liter over the 14-day prep time; but how much would that be per serving for the 2 servings per day??? I drank 8 oz. of bottled organic 100% apple juice, 2x per day for 14 days. Then, I did successfully complete my first flush yesterday. It was a challenge to complete each & every step; but with the encouragement, support & efforts of my husband nearby, I was able to complete the steps successfully. I, too, began to run to the toilet as soon as I began the Epsom salt doses. I was barely able to hold the oil mixture in while laying on my right side for the necessary 20 minutes. It wasn’t until after the very last Epsom salt dose that I began to pass the stones. I was able to catch approximately half of the stones I passed. We counted approximately 100 stones of various sizes, plus a lot of gravel & sand-like stone debris. I’m sure I flushed down the toilet twice as many as we saved & counted. My stones were mostly green in color with some black stones in the mix. I will recommend a few helpful tips: stock up on toilet paper, flushable wipes, lotion for your buttocks, essential oil diffuser, pads for your underwear and just a bit of honey close by to kill the bad taste after the Epsom salt doses, ice cubes for dry lips & mouth, & something to distract you while you wait in between doses. I never fell sound asleep that night. I drifted in & out of naps instead. While this is a very detailed procedure, the successful outcome greatly outweighs the challenge in the steps taken. We all need to show our medical doctors our photos of our flushed-out stones, to PROVE to the medical world that alternatives do exist to surgically removing our much-needed gall bladders. I plan to do this procedure again & again for a healthier liver & gall bladder! Thank you, Dr. George J Georgiou, & God bless you for your courage & care to present this to us all. We appreciate your hard work & efforts. Now..GO FLUSH YOUR STONES!! I did this in 2012 and it helped me so much, and im now on day3 of the apple juice. I have that pain back in my ribs top right which is the code word for do the flush. So happy to see so many people having success with this. Im from South Africa and i am a great believer in natural remedies for all illnesses. And this truly works. Did my flush for the first time about 2 months ago. Felt great for a while so I didn’t think the additional flushes would be needed. Afterwards, my gall bladder has been getting inflamed 2-3 times a day, every day for the past 10 days. Doesn’t matter what I ate, small bites of chicken breast grilled at home, check, steamed vegetables, check, strawberry and banana shake, check. So I tried doing another flush and so glad I did. I was able to catch what appeared to be over 100 small stone and a few larger ones about a centimeter big. Follow the instructions and there will be results. Thank you so much for sharing these simple instructions. I hated the fact that every doctor I saw would immediately recommend surgery and nothing else. There is no enough words to express my gratitude and appreciation. Thanks. I feel blessed to find your website. I finally got the courage to do cleanse. And this morning I saw results. Almost hundred different shape and size gallbladder stones came out. Thank you very much. One day will meet you. At first, I was really hesitant and skeptical to try this method, judging by how the article was written, and it was just something new and unusual. But I’ve still given it a try because I knew that I was not having a healthy lifestyle (I like sweet and salty food). I really felt relieved, like undergoing a major surgery, after the flush. I saw a lot of green and yellowish stones and it made me realize that I should start changing my lifestyle specifically the food I take. This stuff really works! Wow! Never been on a site with so many positive comments. Thumbs up? I have not tried it this way as yet but I do believe all of you including this caring doctor. God bless him. I will certainly try it this summer holiday. I went to a herbal doctor in Jamaica where I live and she recommended doing a flush and yes it worked. I passed big and small green stones. I can eat freely without chest pain. I only did the flush once and it is recommended 6 times to actually pass out everything. I still feel more is there but I can’t afford my doctors meds so thank God for the this online doctor inexpensive way. I just want to say to everyone, thanks for sharing your feedback they are very motivating. God bless you DOCTOR. its a miracle God Bless you! i was told by a MRI imaging of my back that i had gallstones, spoke to my doctor and did an ultrasound, they never mentioned any size gallstone but on the report said that i had multiple, that it was full, i have not had an attach or anything like that but it scares me just to think about it. I wanted to do surgery but my husband did not. so i started researching and found the Andrea Mortiz flush on line and it sounded amazing. then i bought the book on AMazon , i made my husband do the flush first, ( which he never had complaint about having stones or anything) he did it on 7/31/18 and i counted 72 stones, mainly cholesterol ones, i even took them out, and much more tiny ones that flushed on the toilet, so i do believe in this flush. My name is Natoya. I tried the cleanse yesterday (9/10/2018) and it really worked. I saw over 30 bright green color stones. when I touched them it felt soft. The only thing I didn’t do is the last dose of Epsom salt. I truly appreciate this. I will be doing an ultrasound to see if they are all gone. Thank God for this site.. I hv done 3 flushes this year ad my last was on 7/10/18.Am still having terrible pains but not as painful as it used to be..How often can I carry out this cleansing can it be done monthly?cos I have refused surgery.is it safe during pregnancy? Thank you for sharing the procedure. It works! I’ve done two cleansings so far. The first one got out a sand and little stones size like lentils, the second one brought out good size pebbles. I’m going to do that as many times as required. Thank you! My wife had a gallbladder filled with stones and her doctor recommends surgery, but we decided to look for an alternative medicine and we came across with this instruction. It took her 3 months and 4 flushes to eliminate all the stones. Today she had an ultrasound and her gallbladder is clear, no traces of stones. Thank you so much. Thank you God.